We have compiled the best cheats for the latest installment in the Grand Theft Auto series, GTA 5. 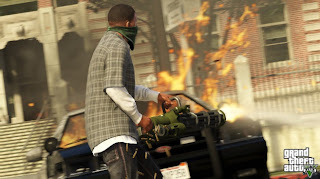 In "GTA 5", the developers have introduced numerous cheats. After entering a combination key you will be able to unlock new vehicles or reduce the manhunt level - and much more. Achievement and Trophy hunters: You will be able to achieve more successes after activating the codes. Spin game: with this cheat you constantly breaks out of the rear of the vehicle; brings nothing but it’s fun and playful.